The first row of an afghan with homespun or bouclé or other knobby style yarn can be frustrating. This afghan does not require finding chain stitches, even for the first row. The lacy basket pattern keeps the afghan light even with a heavier yarn. The example is made in Jo-Ann Sensations Rainbow Boucle. There is also a tutorial video available. Row 2: Ch 4. Without turning the work (holding it so that the tr stitches are on top and the ch-3 loops on the bottom), make a dc in the first sp (over tr just made). Working across the spaces (working over the tr stitches), make a V-stitch in each space to the end of the row. Row 3: Ch 4 and turn. 1 dc in ch-1 sp, Shell in next ch-1 sp, ** ch 1, skip one ch-1 sp, Shell in next ch-1 sp. Repeat from ** across to ch-4 turning chain. V-stitch in ch-4 sp. Row 4: Ch 4 and turn. 1 dc in ch-1 sp, V-stitch in ch-1 space of Shell, ** V-stitch in ch-1 space between shells V-stitch in ch-1 space of shell. Repeat from ** across to ch-4 turning chain. V-stitch in ch-4 sp. Optional border – end with a row 4. Border round 1: Ch 3 and turn. (1 dc, ch 1, 2 dc) in ch-1 sp, mark the shell just made as a corner shell. Ch 1, shell in next ch-1 sp, (ch 1, skip a ch-1 space, shell in next ch-1 sp) across the top of the throw to the ch-4 turning chain. Work the following in the ch-4 turning chain sp: ch 1, shell, ch 1, shell. Mark the first shell in the turning chain space as a corner shell. On the sides of the throw, work in the spaces formed by the ch-4 turning chains and final dc stitches of the rows. Ch 1, and make a shell in the next sp. (Ch 1, skip a space, shell in next space) across the side of the blanket. Ch 1, shell in the last space of the side. Across the bottom of the throw, work in the spaces formed by the ch-3 loops of the foundation loops. Ch 1, shell in the first ch-3 space. Mark this shell as a corner shell. Ch 1, shell in the next ch-3 space. (Ch 1, skip a ch-3 sp, shell in next ch-3 sp) across the bottom of the throw. Ch 1, shell in last ch-3 sp, mark this shell as a corner shell. Work across the last side of the throw in the spaces formed by the ch-4 turning chains and final dc stitches of the rows. Ch 1, shell in the first sp. (Ch 1, skip a space, shell in the next space) across the side of the blanket. Ch 1, shell in the last sp, ch 1, slip stitch to join in the third chain of the first shell of the round. Do not turn. Border round 2: Slip stitch in the next dc, slip stitch in the ch-1 space, ch 4, dc in same ch-1 space. V-stitch in every ch-1 space around the entire blanket back to the ch 4. Slip stitch to join in the third chain. Do not turn. Border round 3: Slip stitch in the ch sp. Ch 3, (1 dc, ch 1, 2 dc) in same sp. (Ch 1, shell in next ch-1 space) two times. (Ch 1, skip one ch-1 sp, shell in next ch-1 sp) around the blanket. On either side of the corner V-stitches, do not skip spaces, so that there are Shells in 5 v-stitches in a row with the 3rd being in the corner v-stitch. Join in the third chain of the first shell of the round. Do not turn. Love this one, will try it using something in the blue/green colors. Feeling like the ocean. This pattern is beautiful. I have started it 3 times and it keeps “ruffling” on me. I’m not sure where I am going wrong. Following the instructions as it says, but I can’t figure out if it’s the shell row or V row that is throwing me off.. PLEASEEEEEEEE help…. I can do a chart or a video if one of those would be helpful. Which do you prefer? At this point, whatever would work best !!! Here is a tutorial video. Let me know if it doesn’t solve the problem. I love this pattern! It is working up beautifully with Caron One Pound “Baby”. Thank you so much for sharing all your wonderful patterns with us and for taking time to make the video tutorials too! I made this as a prayer shawl and it got rave reviews. It’s a quick stitch. Love it & thanks for sharing! It was great to learn this method. Thanks. Will start a project today using which I learned. I’m fairly new to crocheting, but I have a difficult time “finishing off” at the end & making it look good. I have even checked out beginning basic instructions & have found nothing for this. Can you help.? I love your “No Beginning Chain” patterns & have made the Granny Ripple & just finished the Basket pattern as a baby blanket with the border & that’s where I’m at now. Thanks so much for sharing your wonderful patterns & ideas. I have a way I “finish off” that is my own way. I don’t know that it is necessarily the best. After the last stitch, I make an extra chain stitch. Then I cut the yarn with several inches left and pull the end through that loop. I push that knot close to the work to tighten. I then take a yarn needle and work the end into the piece. I try to put the needle through so that I see it the least both front and back so that the end is in the middle of the stitches. I know you have already had this question, but I have been over and over the patteren and the Video, but I keep get the same thing, it starts curling down towards the 1st roll beginning roll starting with the third roll. I have torn this out about 10 times now and studied both patteren and video, but no luck. I thank you for any help you may have. Could you send me a picture of what is happening? Send to mama at thetucker dot com. I started this again to take a picture of it, and for some reason it came out alright this time. I am going to keep this part for a sample, as I don’t know what went wrong before. Thank you for answering me back, I think I can get it now. I am a seasoned crocheter and make versions of my own patterns, I have never seen your version and will definitely be trying this soon. Thanks for all these ideas. I would love to have the pattern, but don’t want to copy all that I would get, printing it. There is a printer icon at the top of the printer. This will create a print-ready copy without the comments. DO YOU HAVE ANY PATTERN FOR THE DALLAS COW BOYS AFGHANS BLANKET THAT I COULD HAVE TO EITHER BUY FROM YOU? AND A VIDEO TOO I WOULD NEED A EASY ONE TO FOLLOW NOT GOOD WITH READING THE PATTERNS. I DO CROCHET BLANKET. MY FRIEND WANT ME TO MAKE HER A COW BOYS BLANKET. AND I CAN’T FINE ANY EASY ONES TOO MAKE. MAY BE YOU CAN HELP ME. THANK YOU FOR YOUR HELP. IF YOU DON’T HAVE ONE MAY BE YOU KNOW OF SOME ONE THAT DOES HAVE ONE. REALLY WOULD LIKE A EASY ONE PLEASE. LOL. THANK YOU SO MUCH. I didn’t find any free patterns. I found a handful of patterns on Ravelry that were $5 or $6. You patterns are beautiful and when you email them they are in a nice format but it would be so much easier if you would put them into a ibook format. Hi, Kathy. I’m so glad you enjoy the patterns! Improving the printing, emailing and saving of patterns is something I’m looking into at the moment, but unfortunately the iBook format has a lot of restrictions around it and can only be saved on a Mac, which I don’t have. I’ve considered offering ebook versions of patterns (or groups of patterns) but I’m not yet sure which formats will be most universally helpful. Thanks for the suggestion, and I’ll let you know what I come up with. 1)I love you designs thanks for sharing them especially for free. 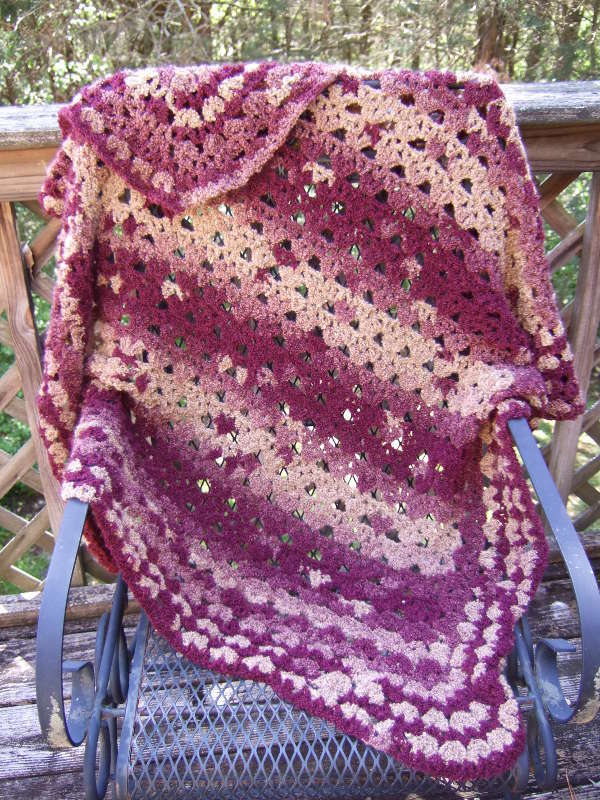 New here – found one of your patterns (Lacy V-Stitch Throw) on “Hooked on Crochet” site. Do you send out email “updates” when you post new? I’d love to be on your mailing list if you do…but I do ask – please do NOT post my email. Thank you for sharing all these beautiful patterns! Your hard work is greatly appreciated! i’m on the next to the last row of the border, row 2, and i noticed that each “corner” is a little bit different,the stitches seem to fall a little bit different is the best way to explain it, ….is this right? also too, im getting a slight ruffle, will this fix itself on the next (last border row)? im using regular worsted weight and appropriate hook. It definitely gets ruffly as you add more rows. As for the stitches falling differently, the intent was for each corner to be right at the corner and to look the same to either side. If you think something isn’t working out, you could send me a picture and I can take a look. I just finished this pattern today in the xlarge size for a gift. It came out beautiful. Thank you so much for the patterns and videos. Your afghans are so beautiful and I truly appreciate that you offer the patterns for them free to us. This one, in particular, is absolutely gorgeous. What colors did you use for this one? I would like to make one the same color. Thank you. This yarn has unfortunately been discontinued. It is Jo-Ann Sensations Rainbow Boucle Patterns in the color 1080 Red/Camel. The Sensations line has been replaced by a line called Purl Essence but the colors all changed. Love this pattern always had trouble making afghans with bulky yarn this worked up fast and perfect. Thank you looking forward to more patterns!! Hi heather , love your just crochet things, and love these blankets etc here too, but unfortunatly not in uk terms, if sc is uk dc. Dc is uk treble, what would your treble / triple be in uk terms please. Thanks again for sharing your beautiful baby patterns, being a farely new starter to crochet i find your patterns the only ines i can understand. It is unfortunate that the UK and US have different crochet terms. The US treble is a UK double treble. Love your work heather, baby patterns are beautiful and easy t follow even for me being farely new to crochet. Just seen these blankets etc are yiurs too, can you tell me briefly if your sc is uk dc, .. your dc is uk treble,…. what would your treble/triple be in uk terms. I love these patterns on here but changing to uk frazzles my brain lol. Thanks again heather for your beautiful baby patterns. The US treble is a UK double treble. Your patterns look very interesting and when I have more time (probably in the summer) I will give them a try. Here’s a suggestion: could you use lighter color yarn in your photographs? It might be easier to see the stitches. this is first time that I have come accross a pattern without the starting chain, seems very interesting,,, going to start right away….thankyou for posting this pattern. want to post my work after it is done, please guide how do I do it ? I don’t currently have a forum for posting photos, but you can post a link in the comments if you have a place to post photos.